SQL Server version : 2016 SP2, We have 22 core and 24 gbs on the server. I can post a query plan. This is a covered index. It is used as non clustered index Scan. If you are unable to adapt the queries, some of these columns in the where clause will remain not sargable. To make your query sargable, You would need to try and remove the DATEADD() functions in the where clause, around Col146. This makes the (possible) index on Col146 not sargable. Making sure that all functions are applied to the variables. You should not take my word for it and double check this. If you could make your query sargable & the sort is not expensive. However, If a lot of rows are returned after the search predicates, you might have to index your SORT (Order by) As well, since that one will use a lot of CPU depending on the amount of rows passing through. We would have to see an actual query plan to determine this. You could try and index that what is sargable and try to remove the SORT operator. What about the other columns? The include list is something I will leave to you, depending on the expected resultset's, the key lookup could be something to live with or not. 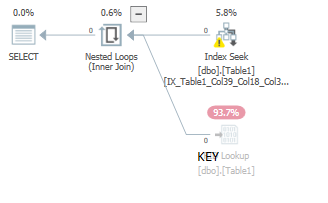 The optimizer might not even use the index if it thinks that the key lookup would be too expensive. To see if what I am saying holds any truth, I conducted a test, ofcourse, YMMV. It is simply to see if it is even possible to remove the SORT operator and that we are able to seek on certain filters. And that is not what was expected unfortunately. Not the answer you're looking for? Browse other questions tagged sql-server sql-server-2016 index-tuning or ask your own question.